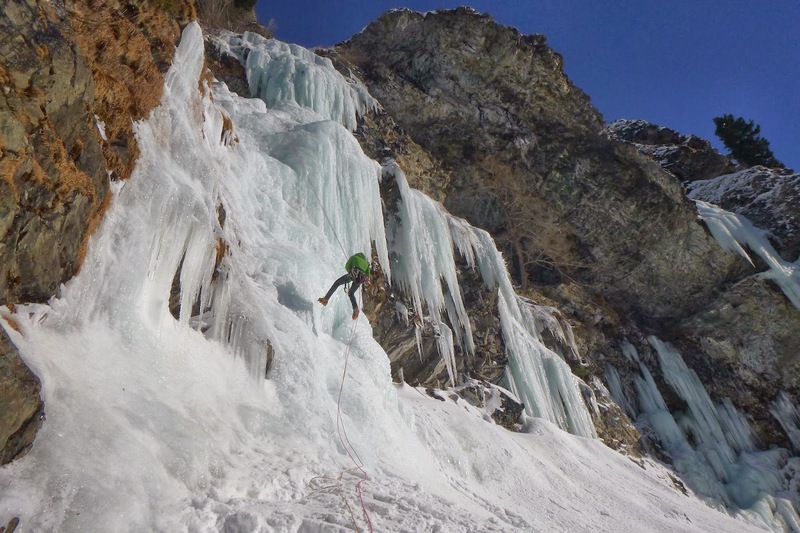 Day 3 in Cogne saw us making the longer approach in the Valnontey to the "Patri" sector ice falls. These climbs are well frequented and deservedly so. The bottom of the climb has a 45 meter bulge at around WI3+ before moving up a long snow coulior with an ice step. 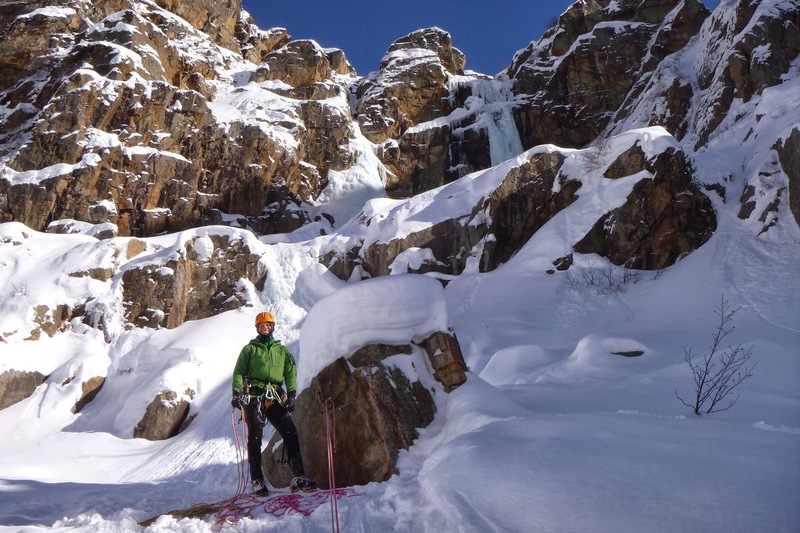 This brings you to the upper snow bowl which has two steep ice branches of two pitches each at WI4 and WI4+. We had heard that over the previous weekend there were 40(!) climbers in the area. We were there on a Tuesday and there were around 5-6 rope teams. On the left hand side at the start of the main flow, an impressive 30 meter pillar had formed at around WI4+/5. After making the 90 minute and 300+ meters of elevation gain in the Valnontey, we waited our turn behind a French couple to start up the main fall. The weather was clear and cold after she following day's storm. The ice was somewhat brittle and crusty. It took a bit of care to insure good placements. on one of the upper branches of "patri"
There were some bottle-necks and rope-crossing/standing under falling ice from other climbers, etc., that comes when inexperienced people are climbing a mid-grade waterfall. I tried to pick the steepest, most well-shelters line possible and time my climbing not to be under any other climbers and reach the belays when the team above was just ready to set off. "Stella Artice" WI5 was on the program for day 4. This is the much-loved harder classic route in the Lillaz valley. first two pitches of "stella article"
It was one of those absolutely perfect days on the ice: blue skies, high-pressure, cold temps. 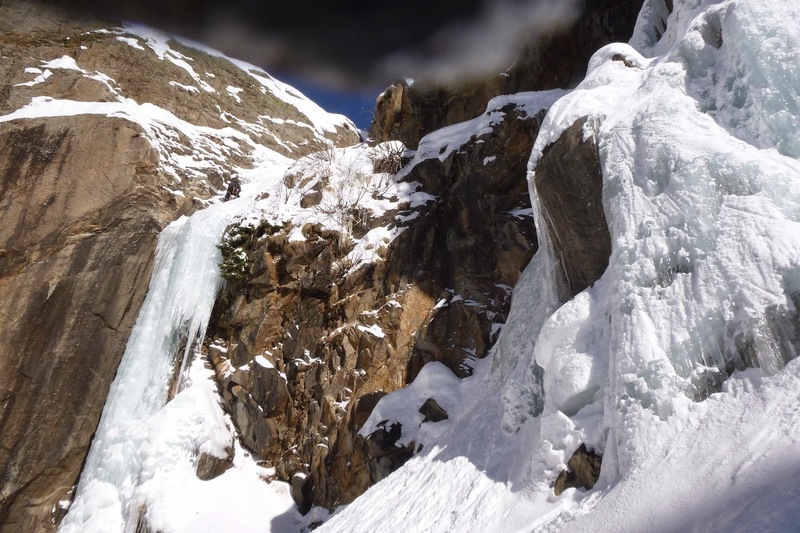 The ice was perfect and there were only 3 climbing teams dispersed throughout the 180 meter climb. The second pitch is the crux of the climb. A column forms for the first part of the pitch. 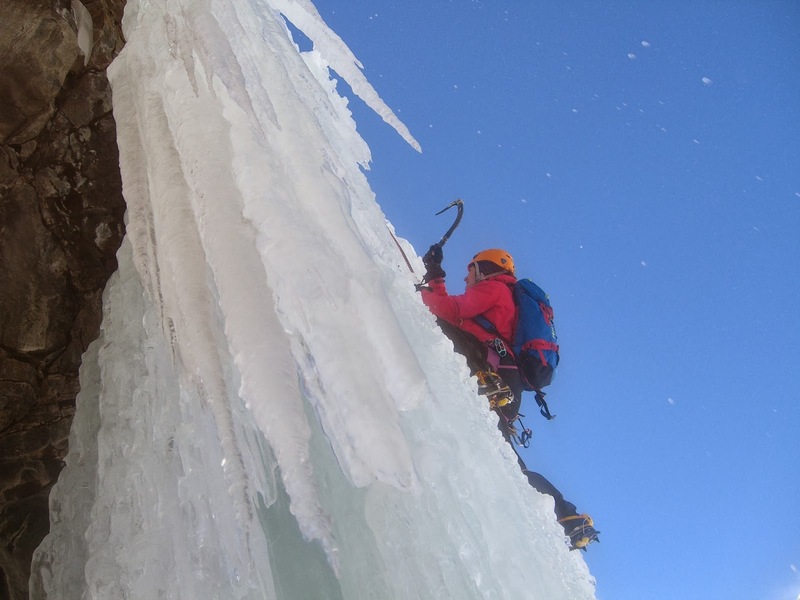 There is a belay possibility just above the column after the ice eases back to the left on a tree with in-siutu cord and slings. You can also continue to the fixed stance further up, using almost all of a 60-meter rope, to get to the piton and sling belay/rappel on the left in the rock. Regardless, the first 12 meters of the pitch are 90 degrees with little overhanging curtains and steps. Very pumpy and demanding of the skill to read the ice line and use the structure of the ice to your advantage. 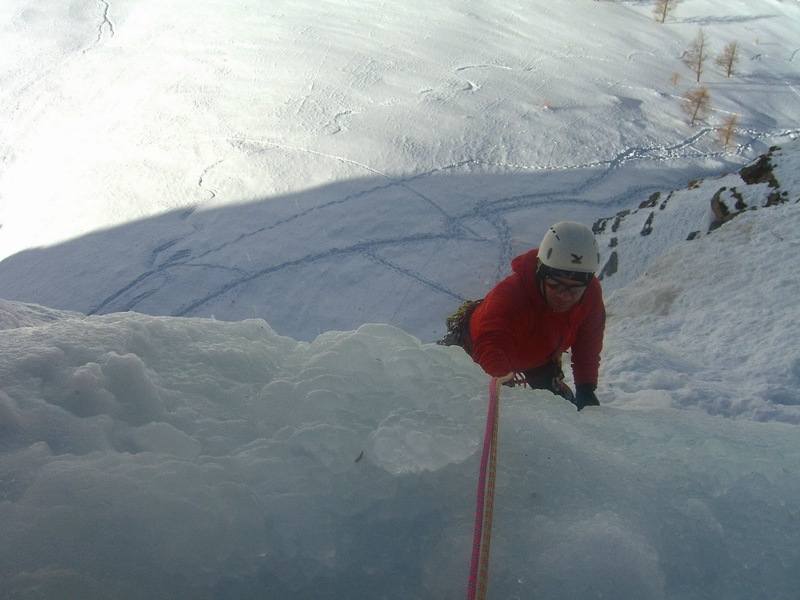 There is a snow gully that leads to the last two ice pitches at the top of the climb. 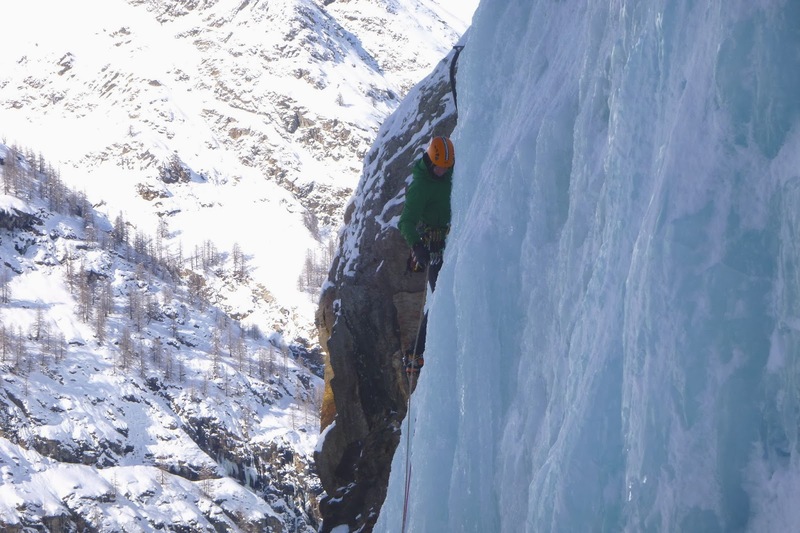 We got to enjoy a rarity while ice climbing - climbing in warm sun shine! beginning of the third ice pitch, moving into the sun! 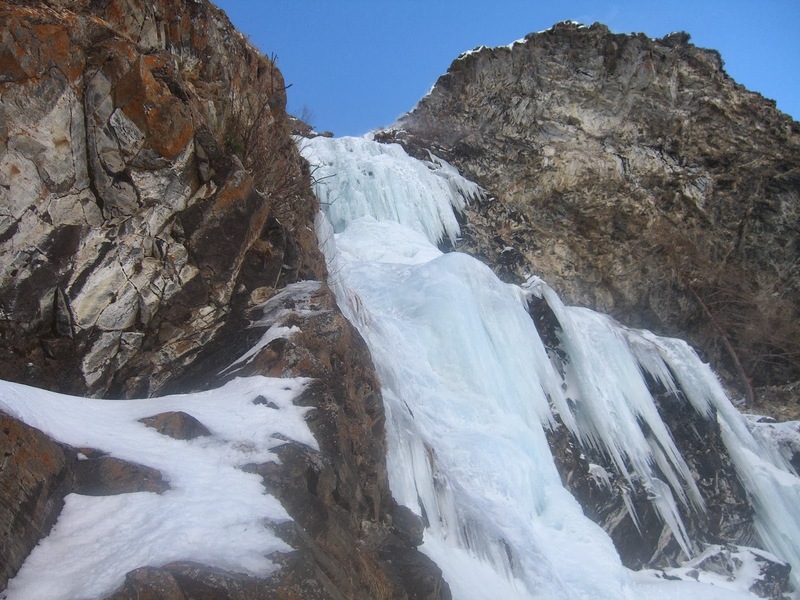 The rocks to the left and above the ice were glistening with droplets of water. The new snow from yesterday that had clung to the rocks was periodically sliding off. I watched a bird continually go into a crack between rocks feeding its newly born young. Only the second week of February and already winter was transforming into spring. At the final anchor, belaying Wolfgang up, I thought of what a perfect climb it had been and how fortunate I was to have been able to do it. We rappelled off, packed up, and leisurely walked out to the parking lot. It had been Wolfgang's first WI5 route. 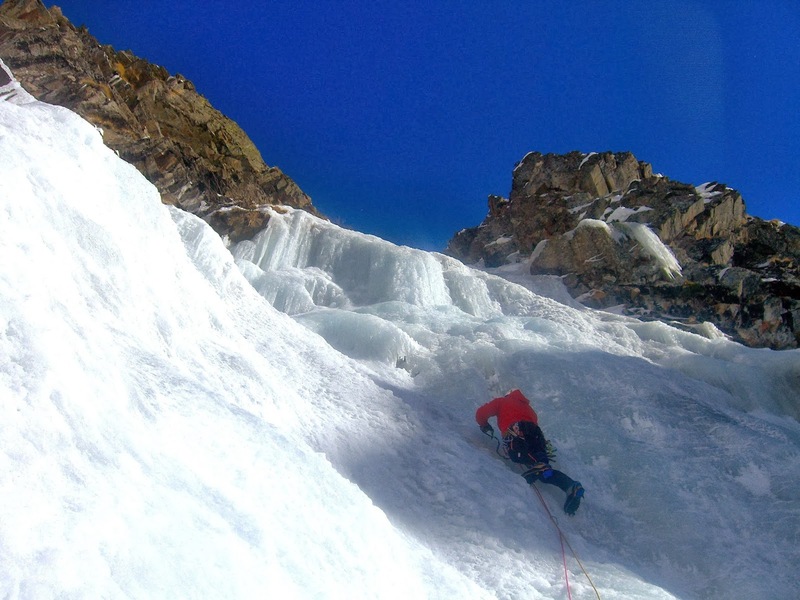 He had climbed the crux pitch well and led the third ice pitch. Clearly a bit of an ice milestone for him. Another thing to add to the experience of a great climbing day.